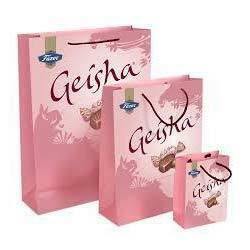 With the aid of our personnel, we are able to familiarize for our valuable patrons Printed Paper Carry Bags that is designed using the finest-quality material and sophisticated technology. To add, this product is highly accredited in the market for its incomparable quality. In addition to this, these can be modified as per the clients’ stipulations. Founded in the year 2006, Deepanshu Graphics is renowned enterprise intricate in manufacturing and supplying of Paper Bags, Self Adhesive Printed Tape, Corrugated Printed Boxes, Office Stationery, Food Paper Bag and Cardboard Business Card Display. We are leading service provider of Offset Printing Service, Printing Services, Screen Printing Services, Self Adhesive Labels Printing Services and Graphics Design Services. Obtainable with us at economical rates, the offered products and services are executed by most skillful personnel and expert employees. These rendered services are highly attributed amid our customers due to their flexibility, customer centric approach, timeliness, accuracy, trustworthiness and promptness. Due to our transparent business policies and customer centered approaches, we are successful in acquisition of reputed place for ourselves.